The Fiesta Bowl didn’t get quite the match-up it expected. In an effort to avoid a third consecutive appearance by Ohio State, the selection committee chose to swap the Cotton and Fiesta bowl participants. The move also prevented a repeat of the epic 2017 USC-Penn State Rose Bowl. The net result? Washington will play Penn State on New Year’s Eve Day in Glendale. 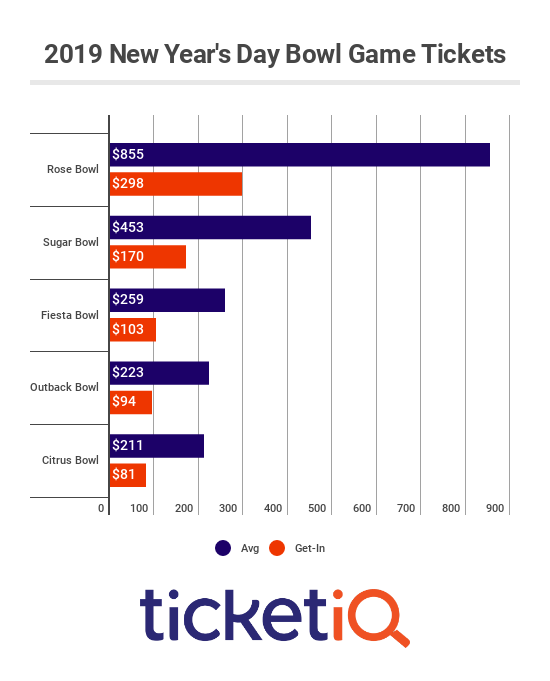 The Fiesta Bowl has traditionally been a fairly pricey ticket. Over the last eight years, the least expensive ticket was the 2013 Baylor-UCF game, which cost an average of $133, according to TicketIQ.com data. But this year’s game figures to beat all others, with ticket asking prices currently at $332. If prices hold, it will be the most expensive Fiesta Bowl since at least 2013, when Oregon played Kansas State and the average price was $296. Penn State loves the Fiesta Bowl. Yep, the Nittany Lions are undefeated in six consecutive Fiesta Bowl appearances, the last one in 1997. For Washington, the game will be the Huskies first appearance in the Fiesta Bowl after last season’s CFP berth. And while the game is a first for Washington, it’s not for coach Chris Peterson, who won the Fiesta twice while at Boise State. For Penn State fans, the cost of a ticket will seem like a break after paying an average of $743 to get into last season’s Rose Bowl. With ticket asking prices currently at $332, the Fiesta will likely be Washington’s second most expensive bowl game since 2010. 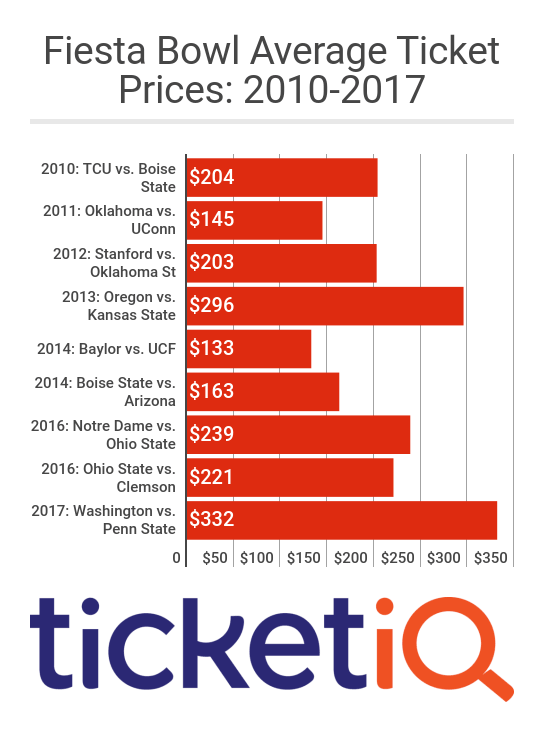 Prices could well eclipse those of last year’s national semifinal at the Peach Bowl ($387), the highest-priced Washington bowl ticket in the eight years that TicketIQ.com has been tracking data. Whether you’re willing to spring for a high-dollar ticket or not, TicketIQ.com can help get you into the game. Current Low Price Guarantee listings include seats at the top of the stadium near the end zone in Sections 435 and 436 for $126 or in the lower bowl in the seventh row of Section 117 for $200.